Which month has the best snow? Myoko is famous for its annual heavy snowfalls. Each year we see resorts breaking the 4 & 5 meter snow depth levels. The resorts open at the end of December and naturally January and February are the prime months for the best snow. While your visit to Myoko may be decided by the kid’s schools holidays or your own work leave, if you have the choice between visiting in January or February what is the difference between these months and is one better than the other? This is the month of deep snowfalls. It is common to see consecutive days of snowfalls that can be between 40 – 90cm. You can often see up to 3 days of continuous heavy snow. The common pattern is to see a heavy dump and then for the weather to ease up for a few days and then to get another huge dump. This makes January an amazing month for that huge powder. The really deep good stuff. You are pretty much guaranteed to experience fresh deep powder in January. With the continual snow and heavy snowfalls, it will most likely be snowing while you are on the slopes, meaning reduced visibility, lower temperatures and fewer chances of those beautiful bluebirds. If you take a look at our daily snowfall chart for the last two seasons, you can see how at the beginning of January we have 3-4 days of 40cm followed by a short break and then a mega dump of 90cm! Then after a brief break we pretty much have continuous snow from the 16th until the end of January. Lots of gorgeous powder but no bluebirds here. Looking at the chart you can see that the beginning of February gave us a break from the heavy snow of the previous month then we got a great top up mid-Feb with some heavy snow followed by a week without. Looking at the chart from snowjapan.com we can see that February receives about 2/3 the snow of January. While there is a period of heavy snowfall there are also longer breaks without the snow. This means more beautiful bluebirds so you can enjoy the sun and scenery while you are on the slopes. So as to which month is better, well let’s be honest they are both damn amazing. January will guarantee you tons of fresh powder, pretty much all through the month. 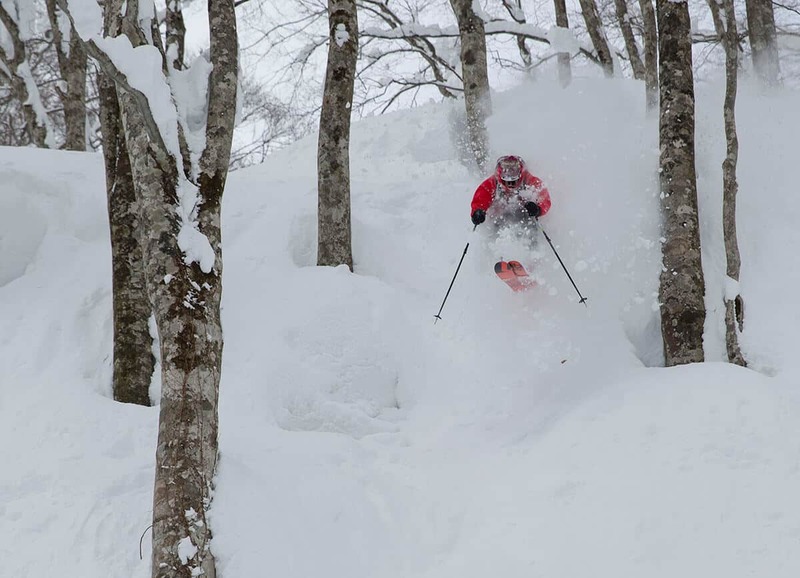 You will nearly always be on fresh snow and experiencing that famous Myoko powder. February will still give you a lot of fresh snow, but there will be patches through the month where the snow will have a break and you get the most amazing bluebirds and can see some breathtaking views from the top of the resorts. Both of these months are great times to be in Myoko! Let’s not forget March. The snow drops off a lot in March but there is still fresh snow falling during this month. The weather starts to turn spring like during March so you will get plenty of beautiful blue skies and some warmer weather. The crowds also disappear a bit as the peak season has passed so the slopes and resorts will be a little less busy, especially on the weekdays. This is a great season for some spring skiing in great weather while also getting some smaller snowfalls during the month. Myoko Tourism is the offical English tourist site for Myoko City.